Ugh. Monday. Coming down with a cold. I haven’t had a cold in over two years, and I’m really hoping to kick this one fast! Despite my runny nose and sore throat, I ended up getting in five easy miles while watching the Chargers v. Colts game. It wasn’t the 10 miles that I should have gotten in, but I felt happy that I got any in. 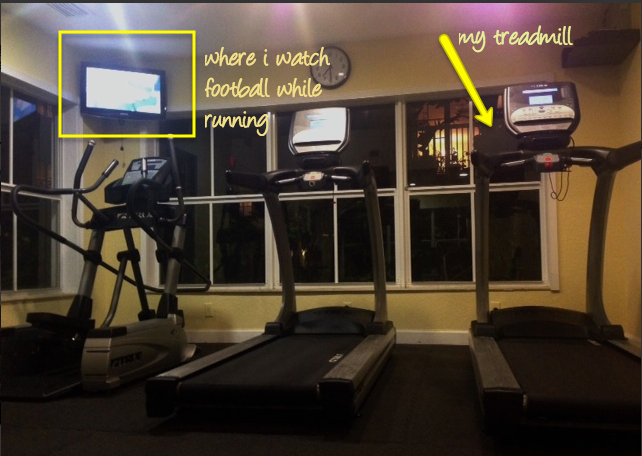 Just in case you were ever wondering what my exciting gym setup is like. While I was checking out Twitter (@eastcoastk) this weekend I saw a ton of people tweeting about finishing their Disney races! I am now getting pretty excited about running the Princess Half next month! Should I be Cruella or a Dalmatian? <<< not a question I thought I’d ever ask. Both of these tutus are from Race Junkie on Etsy. I am willing to put a big bet down that it’s going to be hot on race day, so I want a costume that is simple. I can pair one of these tutus with a simple black or white top and black capris and be ready to roll. No bulky, slippery, sliding or potentially annoying accessories necessary. The only bummer is that I will have no need to wear a tiara. What do you think? Cruella, Dalmation or a different skirt? Is dressing up for a race silly? Have you ever completed a runDisney race? – This will be my first. I had signed up to do Mickey’s Jingle Jungle last year but it ended up falling the same weekend as the Fort Lauderdale Half so I didn’t go. Next Post Multiple 12-mile runs?! I think costumes at certain race are fun, and I know Disney really encourages them! Make sure to practice running in the skirt before race day! I like the dalmatian skirt! Some costumes make me question people’s sanity… especially those big full body costumes. How do they not sweat to death?! I am leaning towards the Cruella skirt as well just because it’s so different! I know, they sell out SO FAST especially for being fairly expensive. I was on the site hitting register as soon as it opened this year! That little tv is so hard for my eyes too. I can only watch football on it because I just follow the ball and don’t worry about focusing on too many details 🙂 I could never watch a regular show on that thing! I am partial to Sparkle Athletic skirts! I wore a tutu once and it kept chafing my elbows/arms (weird right) since I am so short. Ohhh I can definitely see how that could happen. I will give my tutu a test before I get to Disney to make sure that doesn’t happen. The Sparkle Athletic skirts are really cute (and so reasonably priced!). I may have to get one just because! I vote dalmatian! I wore a tutu under my sparkle skirt for the WDW Half and it is definitely more chafy than a sparkle skirt. Be sure to put glide everywhere it might tough. Thanks for the tip! I will definitely BodyGlide up! 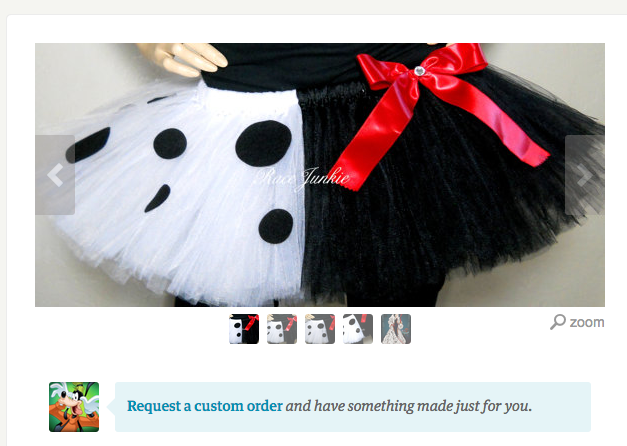 Both tutus are super cute but I really love the Cruella tutu! I can’t wait to get dressed in costume for race day! Me too! 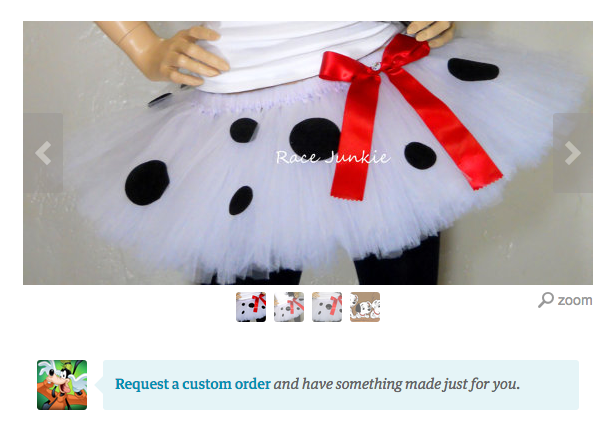 I know cruella isn’t exactly a Disney princess, but it’s such a cute tutu!